This guidebook was written to help priests appreciate better the beauty and power of Confession and to administer it more effectively to the faithful. Beginning with the universal call to holiness, it points out ways to serve penitents by helping them to acknowledge and confess their sins. Among other features, the book includes leading insights of classical moral theology on the nature of the human person, ideas on how to catechize and motivate people to use the Sacrament of Penance and Reconciliation more frequently, experience in giving advice, suggestions on helping penitents to make complete and sincere confessions, approaches to guide and support persons to live the virtues, and quotes from Magisterial documents. 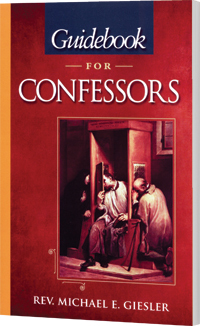 Guidebook for Confessors draws on the proven tradition of holy and effective confessors and spiritual insights from Sts. John of the Cross, Philip Neri, John Vianney, and Josemaria Escriva. It includes insightful quotations from the writings of Popes St. John Paul II and Benedict XVI.